Our 2019 Garden Plan - A Garden Of Abundance, Variety and Color! Our 2019 Garden Plan – A Garden Of Abundance, Variety and Color! 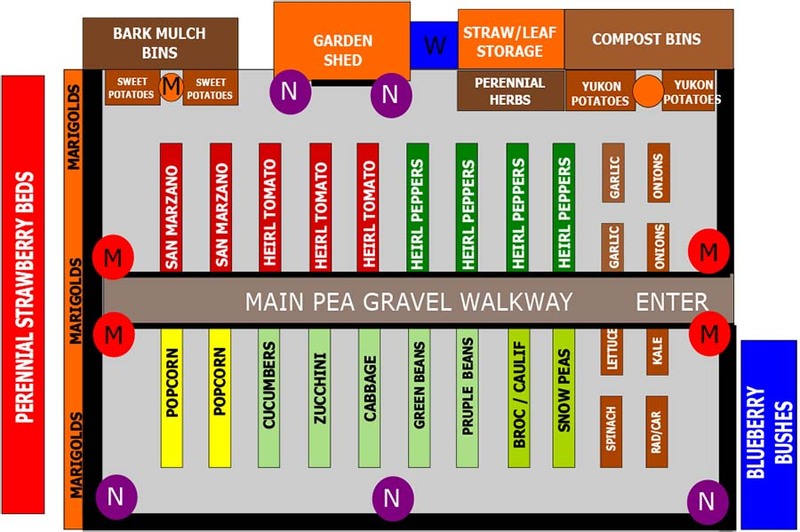 It is time to reveal our 2019 Garden Plan! And I have to admit, I think this year’s garden is going to be one our all-time favorites. We will cover our plan in detail below, but first, a little look back at last year. From a gardening standpoint, last year was a difficult one for sure. Planting a garden, and then trying to maintain it from 450 miles away, is quite the challenge. The Raised Row Method worked wonders last year. Especially considering we were absent from the farm nearly all summer. But somehow, it all worked out incredibly well. 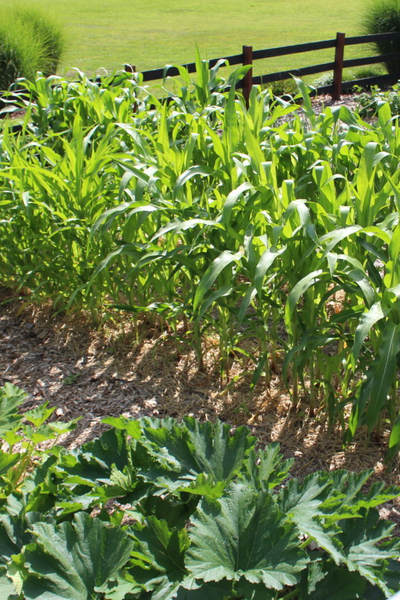 In the process, it also revealed some amazing results about the power of Raised Row Gardening. The 2019 Garden Plan – A Year To Be Here! 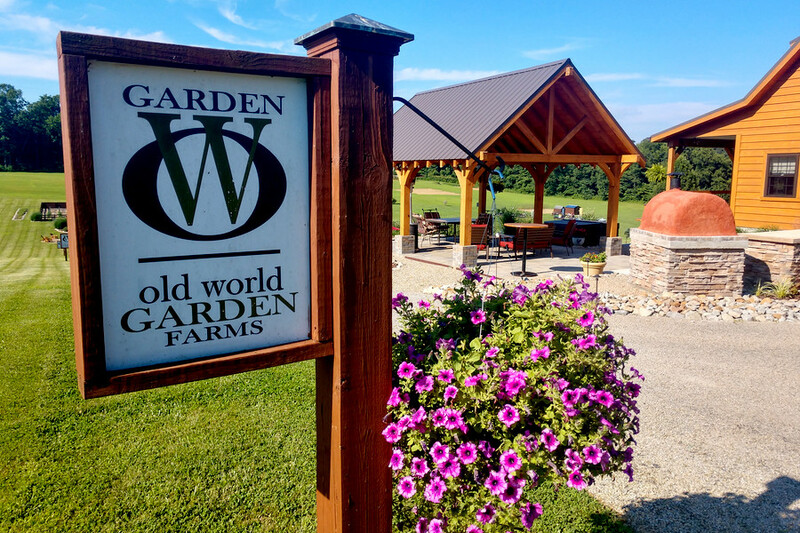 So before we get to the 2019 garden plan – here is a quick review of the 2018 garden. In 2018, we spent less than a total of 8 working days in the garden after planting. Needless to say, the Raised Rows kept working well beyond our dreams. The heavy application of bark chip mulch kept the walking rows in check from weeds. And the straw and compost mulch in the growing rows worked equally well. In fact, there was hardly a weed to be found. A single day’s picking from last year’s harvest. Further more, the straw and compost combo mulch around our plants kept them safe and secure from the environment and pests. Other than the day we planted, with a bit of help of Mother Nature, we never watered again. Well for starters, we are back to enjoy our garden full time this year. And that, of course, makes it better already. Just getting to be back at the farm full time for the garden season makes it better already! But even more, we are planning a garden this year to maximize the planting space like never before. We will be planting flowers and herbs that are filled with color all around our vegetable plants. 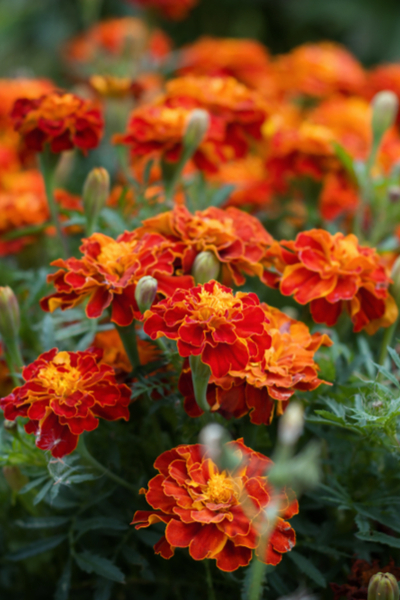 Marigolds are an incredible companion plant in the garden. They will play a huge part of our Big Garden Experiment. It should make for an explosion of color and health like never before. Here is a look at it all below. Without a doubt, this year’s garden plan is one full of flavor, abundance, variety, color and companionship! We will be planting nasturtium, marigolds and basil in the growing rows and in pots throughout the garden. The Garden Plan – There is a full size view at the end of the article too. Not only will we be taking advantage of their beauty, but they will also help with repelling insects and disease! Plants : San Marzano, Hillbilly, Tiger Blush, Purple Cherokee, Mr. Stripey. Green Tomatilo, Black Krim, Brandywine. Tomatoes are the favored plant in our garden every year. 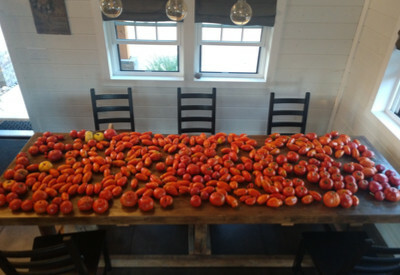 We use large quantities to eat fresh, and to make our salsa, picante, pasta sauce and tomato juice. The San Marzano Tomato. The best salsa and pasta sauce tomato around! 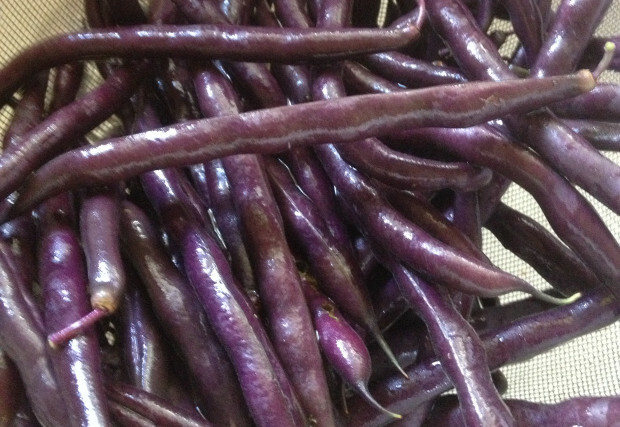 They also are a big ingredient in our vegetable, chili and tomato soup recipes. We will plant 5 rows of tomatoes this year, 36 heirloom tomato plants in all. 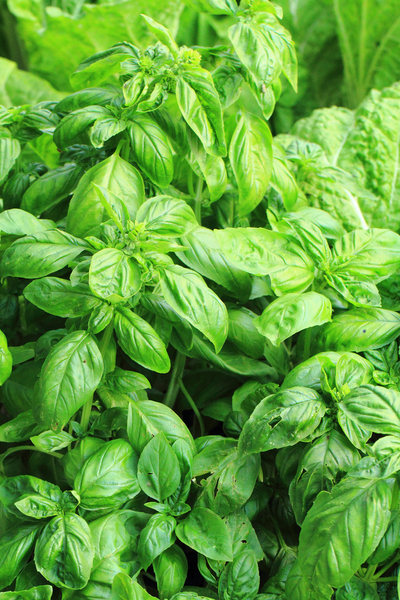 But for a change, we will be planting huge quantities of basil in every row as well. Basil is a huge companion of tomato plants. It can help repel diseases and pests. It is also thought to improve the flavor of tomatoes when grown in close proximity. Two rows will be dedicated to our absolute favorite paste tomato, the San Marzano. 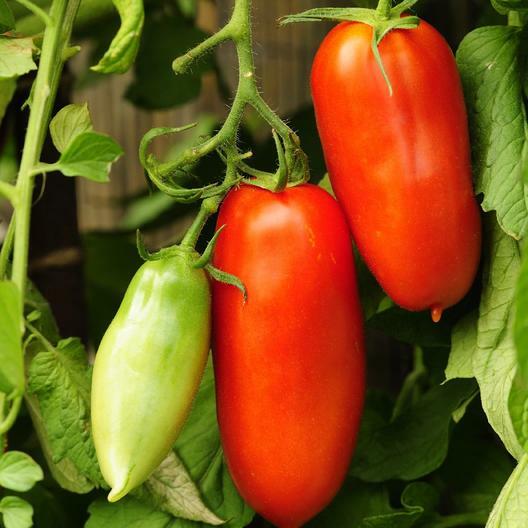 The San Marzano produces perfect sauce and salsa tomatoes all season long. 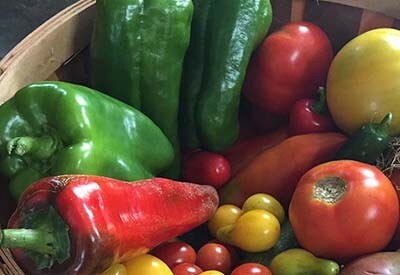 Beyond that it will be a host of other great tasting heirlooms – from yellows, reds, striped – and everything in between. Next to tomatoes, peppers are our 2nd biggest crop. We plant a big mix of mild, sweet and hot heirloom peppers. This year, our pepper plants will use up four of our growing rows. Our favorite of all remains the Italian Roaster. It is a meaty, green pepper with a hint of sweet flavor. And it grows big! With peppers up to 12″ long, they are perfect for stuffing, slicing, and for the grill. This year, we are also going to plant Chinese Five Color peppers throughout the garden rows. It is a simply gorgeous plant. 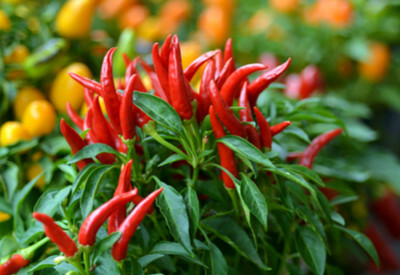 The plants become filled with 1″ inch tasty, hot peppers, in a beautiful array of 5 colors. They are also a wonderful repelling plant for many insects. 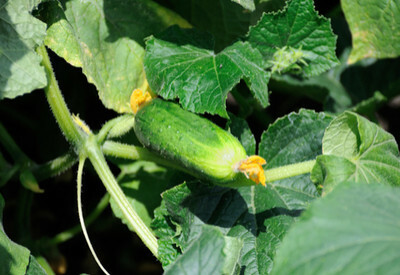 This year, we will plant extra cucumbers among our popcorn rows. Corn and cukes do well together. A great crop of cucumbers means a cupboard full of pickles! We will still plant our regular rows as well – adding in egg plant, zucchini and squash plants too. Beans are such a great garden plant. They give so much produce for the space they take. And they help to recharge the soil. We usually can get two plantings of sugar snap peas and beans. We plant an early summer planting, and a fall one as well. We only know one way to grow our potatoes. And that is in our easy to plant, grow and harvest homemade crates. 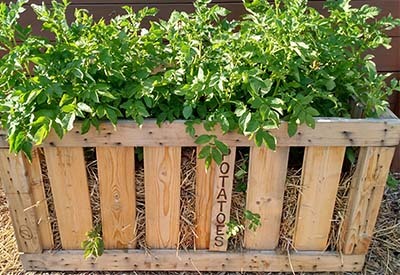 Growing potatoes in crates. A simple way to a big harvest! We will grow 4 crates in all. 2 sweet potatoes (beauregard), and two traditional white potato crates filled with our favorite Yukon Gold. They both are great varieties for growing in crates. And planted right in front of our potato crates will be huge potted containers of marigolds. Marigolds are a wonderful companion to potatoes for repelling unwanted pests. And they will add some big color to the top of the garden. 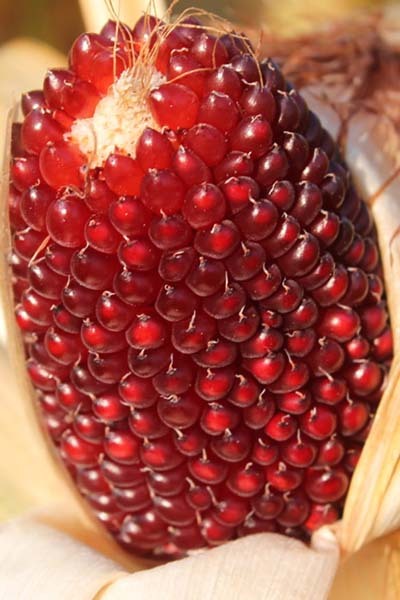 Homegrown popcorn is easy to grow, and incredibly healthy as a snack! We will grow 2 full rows of it this year. With it, we will plant zucchini and cucumbers in the rows as well. It is a chance to get a bit of extra harvest, and they benefit from the corn’s growth and protection. 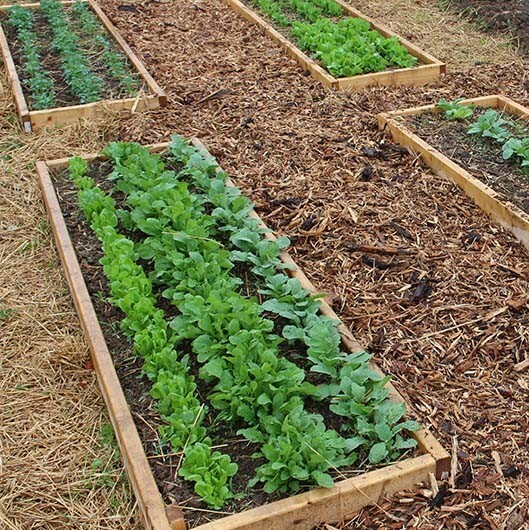 A few years back, we installed 8 small raised beds for rotating greens and salad crops. It has worked incredibly well in keeping us in fresh salads greens from early spring till late fall. This year, we plan on keeping them completely full using the succession planting technique. We will plant a few rows every week to keep fresh produce at peak harvest throughout the growing season. Well – there you have it! Our 2019 Garden Plan. Here is to planning your garden this year, and growing big. Happy Gardening! Jim and Mary. By the way – if you are looking for a great total seed packet combo for a garden – or the gift of a garden, check out the Heirloom Deluxe Pack from Truleaf. Ann, Good question! We rotate all of them – it really helps to promote healthy plants and good soil. Do you rotate all of your crops or only your salad greens? Hello! When planting flowers/herbs among your plants are you, for example, planting one tomato one basil etc…? I love your site! When you put your wood chips down are they damp? Slugs love the damp conditions and here is an article to help with deter slugs: https://oldworldgardenfarms.com/2018/05/13/stop-slugs-naturally/ As for the snakes – yikes!! We have had a snake in our garden before – but I have only found it on a hot summer day wrapped in a coil around the base of one of our plants. We have a mutual agreement – to leave each other alone! Hi Patty The best way to deter mice are natural predators such as cats, owls, and hawks. However some people have good luck with planting mint or onions – mice don’t like the smell of either. We have had very little damage in our potato crates from rodents, but we also have garlic and onions within close proximity to them. Hope this helps. What are the overall dimensions of your garden? Hi I love reading your website. I grow my potatoes in half wine barrels and I have a problem with mice, also in my raised beds I wonder if you have any natural ways to deter them? Last year I used wood chips in the rows between beds and had a LOT of slugs and snakes which I never had before. Have you had this problem… any idea how to get rid of them? Thanks, love your blog. I really enjoy reading your posts and have learned a lot! You seem to have a magic touch with starting things from seed. Any tips? I tried 3 different times to start Japanese eggplant from 2different varieties of seed but never got a plant that grew in the garden. I managed to have seedlings that were a couple of inches tall, transplant to the garden but they never grew from there. I still have a few seedlings in the garden after almost 2 months but they haven’t grown at all times! Any suggestions will be most appreciated.